From students to teachers, from retailers to big businesses, everyone needs a website either for their business or just to create a personal blog to share your thoughts with the world. With this Internet age blooming around the world, you should not be left behind living under the rock with no website or blog of your own. There is no limitation as to what you can do with your website. You may be creative, but if you do not know how to make a website, you will have to shell out huge amount to get one made for yourself. Why to spend when you can it all by yourself? The very first step is to think of a name for your website. More than 10,000 domains get registered every minute, and finding a domain name of your choice is quite tedious. Think of something out of the box which is available for purchase. Once the name is decided, you should think of which of the TLD will suit you. Some of the popular ones are .com, .org and .net which most of people opt for. You can register your domain name from popular registrars like GoDaddy, BigRock, Wix etc. The next step is to get a server for your website where all your files and data will be hosted to be served to your visitors. The domain needs to be connected to your hosting server in order to serve these website files. Having a reliable hosting provider is very important because a few minutes of server downtime can cost you a lot more than you can imagine. Maybe a potential customer is lost? Therefore, make sure you do ample research on which hosting provider suits the best for your needs. Some of the popular hosting providers are BlueHost, Godaddy, HostGator, iPage, Digital Ocean, ASmallOrange etc. They charge a monthly or yearly fee as per your requirement. CMS means Content Management System. Some popular CMS are WordPress, Joomla etc. WordPress is most preferred CMS around the world. You can install WordPress from the cPanel your hosting provider gives you. Simply click on Install WordPress and you will have it installed it in a minute on your server. Once installed, you will be asked to fill important details like Admin email, Admin username, Admin password, Directory to be installed etc. Once everything is set, change the name servers your host has given you, into the domain admin account. This will ensure your domain is connected to the server. You can now go to your website dashboard by going to www.yourwebsite.com/wp-admin. You can learn more about using the dashboard by going to WordPress website. This is probably the most important step to make a website which is user friendly, good looking and easy on eyes. Getting the perfect design, color choices and site structure is of utmost importance if you want your visitor to stay on your website. There are free themes as well as paid themes available for various uses, depending on the niche of your website. One of the popular themes providers are Wix, Themeforest and a few more. 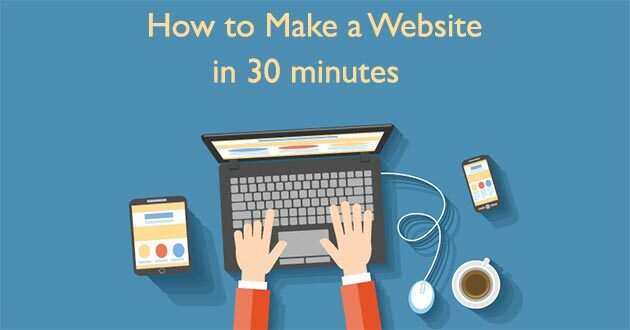 There you go, the above steps will take a mere 30 minutes to get started with your first website. If you still find these steps difficult to follow, you can watch the video below which will help you understand exactly how to go about making a website in under 11 steps and take action step by step. Once you go through the entire video, let us know about your experience in creating the first website of your life.